Released April 2010! JJDesigns Collectors Club Membership Figure 2010. 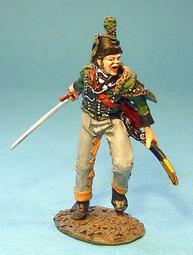 John Jenkins joined the 104th Regiment on 9th September 1804 as an ensign. In 1812 he was offered a captaincy in the Glengarry Light Infantry. It was recorded that he was a man of "striking appearance", and a member of a New Brunswick Loyalist family. He is remembered for his leadership at the right column in the capture of Ogdensburg. General Orders on 25th February praised Captain Jenkins, as "the hero of Ogdensburg". During this engagement he was to suffer severe wounds to both arms, which saw his left arm later amputated at the shoulder. After spending the summer in hospital, he was appointed town mayor of Fredericton, in New Brunswick. He was to die in New Brunswick on 9th February 1819. The Glengarry Light Infantry was formed in 1812, by order of Lieutenant General Sir George Prevost. They were recruited from settlements of discharged Scottish soldiers in the Glengarry district. They were originally intended to wear highland uniforms, which would have included kilts, but instead they were issued with the dark green uniform with black facings of the Rifle Brigade. Although instead of rifles the Glengarry were only armed with muskets. Companies and detachments fought in several actions in Upper Canada from 1813, and the whole unit fought at the Battle of Lundy’s Lane. The unit specialized in British Light infantry tactics and was well trained in skirmishing duties. The unit was disbanded in 1816. The first piece which will be available this April 2010 as the JJD MEMBERSHIP FIGURE 2010. The membership for this figure will be valid until December 31st 2010. As a club member you will have the opportunity to purchase "SPECIAL CLUB SETS".